Persistent and usually fluctuating disorders of mood in which the majority of the individual episodes are not sufficiently severe to warrant being described as hypomanic or mild depressive episodes. Because they last for many years, and sometimes for the greater part of the patient's adult life, they involve considerable distress and disability. In some instances, recurrent or single manic or depressive episodes may become superimposed on a persistent affective disorder. A chronic depression of mood, lasting at least several years, which is not sufficiently severe, or in which individual episodes are not sufficiently prolonged, to justify a diagnosis of severe, moderate, or mild recurrent depressive disorder (F33.-). 坂元薫：気分障害における病前性格の生物学的意義．精神科2002 ; 1 : 433―443. 広瀬徹也: 臨床精神医学講座第4 巻気分障害(広瀬徹也, 樋口輝彦責任編) . 中山書店, 1998,pp .3 - 19 . 広瀬哲也　Soft Bipolar Spectrum臨床精神医学, 30(6) : 667-669, 2001. 阿部隆明　Soft bipolar disorder(軽微双極性障害)概念について　臨床精神医学, 35(10) : 1407-1411, 2006. 神庭重信，平野雅己，大野裕：病前性格は気分障害の発症規定因子か．精神医学2000 ; 42 : 481―489. 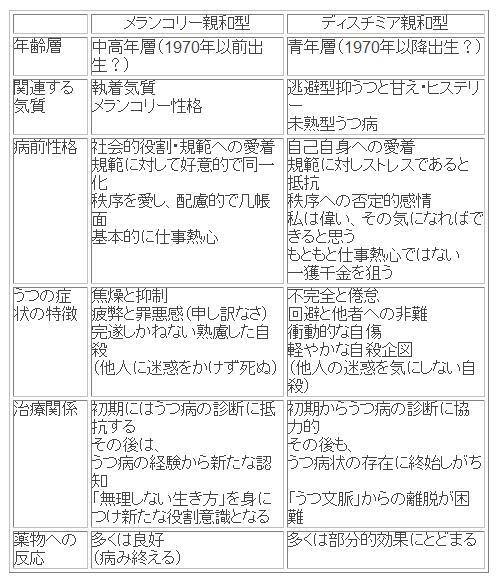 うつ病者の生活リズムと競争社会　松浪克文　こころの健康, 10(1) : 54-61, 1995. 心療内科からみたテクノストレス症候群　村林信行, 筒井末春Pharma Medica, 12(6) : 61-64, 1994. 4)American Psychiatric Association:DSM,IV sourse book. APA,Washington,D.C.,1996. Akiskal,H.S.,Bitar,A.H.,Puzantian,V.R.et al. :The nosological status of neurotic depression:a prospective 3-4 year follow-up examination in light of the primaly secondary and the unipolar-bipolar dichotomies.Arch.Gen.Psychiatry,35:756-766,1978. Akiskal,H.S. :Dysthymic disorder:psychopathology of proposed chronic depressive subtypes.Am.J.Psychiatry,140:11-20,1983. Akiskal,H.S.& Cassano,G.B.(eds.) Dysthymia and the Spectrum of Chronic Depressions,The Guillford Press,1977. Cloninger CR, Svranik DM, Przybeck TR : A psychobiological model of temperament and character. Arch Gen Psychiatry 1993 ; 50 : 975―990. Cloninger CR, Przybeck TR, Svrakic DM : The tridimensional Personality Questionnaire : U.S. normative data. Psychological Report 1991 ; 69 : 1047―1057. Cloninger,C.R.,Svrakic,D.M.and Przybeck,T. R.:A psychological mode of temperament and character.Arch.Ge11.Psyc11jatry,50:975-990, 1993. Kernberg,O. ;Clinical dimensions of masochism.ln:Masochism;Current Psychoanalytic Perspectives ed.by Glick,R.A.,Meyers,D.I., Hillsdale,N.J. ),pp.61-80,Analylicpress, Hillsdale,1988. Gunderson,J.G.,Phillips,K.A. :A cullent view of the interface between borderline persollality disorder and depression.Am.J.Psychiatry,148:967-975,1991. こころの健康, 10(2) : 3-25, 1995. 分子精神医学, 2(1) : 92-94, 2002. 臨床精神医学, 31(6) : 639-647, 2002. 臨床精神医学, 36(1) : 11-23, 2007. 臨床精神医学, 34(5) : 605-613, 2005. 臨床精神医学, 34(12) : 1699-1707, 2005. Pharma Medica, 22(7) : 181-184, 2004. 医学のあゆみ, 219(13) : 893-897, 2006. 臨床精神医学, 34(5) : 543-549, 2005. 臨床精神医学, 34(5) : 573-580, 2005. 臨床精神医学, 34(8) : 1080-1081, 2005. 綜合臨牀, 53(3) : 458-460, 2004. 日本心療内科学会誌, 8(2) : 103-107, 2004. 分子精神医学, 3(4) : 366-371, 2003. 産婦人科治療, 82(1) : 51-55, 2001. 臨床精神医学, 30(6) : 667-669, 2001. こころの健康, 10(1) : 54-61, 1995. 臨床精神医学, 35(10) : 1407-1411, 2006. 産業ストレス研究, 8(4) : 209-214, 2001. モダンフィジシャン, 19(1) : 45-48, 1999. 産業ストレス研究, 3 : 28, 1995. 産業衛生学雑誌, 48(4) : 87-97, 2006. 産業衛生学雑誌, 46 : 427, 2004. 産業衛生学雑誌, 46 : 413, 2004. 心身医学, 43(10) : 679-688, 2003. 産婦人科治療, 83(6) : 709-717, 2001. 産婦人科治療, 82(5) : 593-598, 2001. 薬局, 50(1) : 613-619, 1999. Progress in Medicine, 19(4) : 869-873, 1999. 臨床精神医学, 36(4) : 417-433, 2007. 臨床精神医学, 34(4) : 471-486, 2005. 心身医学, 45(5) : 341-349, 2005. 産業衛生学雑誌, 46 : 320, 2004. ナーシング・トゥディ, 18(1) : 38-43, 2003. 産業ストレス研究, 6(3) : 147-152, 1999. 産業ストレス研究, 6(4) : 197-201, 1999. 脳と精神の医学, 8(4) : 419-427, 1997. 産業ストレス研究, 3(1) : 5-11, 1995. 治療, 76(3) : 963-967, 1994. 脳と精神の医学, 3(3) : 353-361, 1992. 臨床脳波, 50(6) : 354-359, 2008. バイオフィードバック研究, 34(1) : 86, 2007. Medical Practice, 23(3) : 521, 2006. 小児保健研究, 67(1) : 72-80, 2008. 産業ストレス研究, 11(4) : 199-204, 2004. 性格心理学研究, 11(1) : 56-57, 2002. 臨床精神医学, 30(2) : 208-209, 2001. 臨床精神医学, 30(5) : 533-537, 2001. 性格心理学研究, 10(1) : 35-44, 2001. 心身医学, 40(3) : 191-197, 2000. 老年精神医学雑誌, 16(5) : 560-566, 2005. 臨床精神医学, 34(9) : 1197-1198, 2005. 臨床精神医学, 33(8) : 1027-1033, 2004. 日本病院・地域精神医学会誌, 47(2) : 229-231, 2004. PROGRESS IN MEDICINE, 27(9) : 2005-2008, 2007. 脳21, 10(1) : 115, 2007. 綜合臨牀, 55(5) : 1541-1543, 2006. 交流分析研究, 21(2) : 138-148, 1996. 産業衛生学雑誌, 37(6) : 428, 1995. Pharma Medica, 12(6) : 61-64, 1994. 日本小児科医会会報, (27) : 7-10, 2004. 矯正臨床, 20 : 84-85, 1998. チャイルドヘルス, 9(9) : 641-644, 2006. チャイルドヘルス, 9(11) : 811, 2006. 交流分析研究, 30(1) : 43-50, 2005. チャイルドヘルス, 7(5) : 336-352, 2004.